Christmas comes but once a year and when it does it brings Good Cheer! Well, we have the ultimate of the latter to announce……..Louise and Keith Martin are now proud parents. 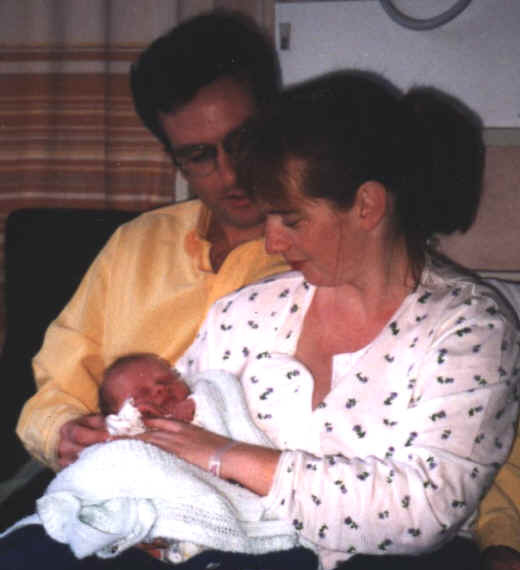 Around noon on the last day of 1999, Rebecca Louise was born! Mum and Baby are doing well although Keith looks as if he needs another Guiness. Any respectable scientific journal would, of course, ignore the festive season and continue regardless. It would also ignore the Millennium! We, needless to say, accept this and hence offer an edition of true scientific merit. Slim because of production difficulties, but none-the-less significant. As we wish to claim the FIRST scientific paper of the new Millennium! You will find a paper in the Submitted Paper Section from Tom Klapotke and Margaret-Jane Crawford from the University of Munich. Note the submitted and accepted dates and times. How, you ask was it done? Well Tom was out-of-town on New Years Eve – in fact he was in in Scotland for the Super Hogmanay celebrations! (As Tom used to be on the Faculty at the University of Glasgow and knows Scotland well) So – Tom’s Mum sent the paper to me from Berlin at 23.50pm Berlin time by fax. I was at a dinner party and left it to collect the manuscript off my fax machine and sent it immediately to two American referees in Washington D.C. They were getting ready to go to their New Year bash but refereed the paper instantly. Their combined report was typed up at 19.01 EST and they recommended that we accept. This reached the UK by fax at 0.21 GMT on 1st January 2000! So there you are! AND note No Millennium Bug! Tom and Margaret made minor corrections when he returned to Munich and hence here it is! You will notice the paper is highly topical and historic combined – it refers to a compound first described in 1900! We start with a significant report on the discovery of the Raman effect by one Dr. S. Claus. It seems Dr Claus, gave a talk last year on December 17th at Kings College, London and we have been able to persuade him to produce a transcript for your edification. This feature article is worth detailed consideration because although Claus is an acknowledged expert on the subject it is notoriously difficult to persuade him to contribute.